Whether you're at the family reunion or tailgate party, sometimes you just have to cook a lot of food for a lot of people. No matter the size of the crowd, the Professional Flat Top Griddle is big enough to get the job done. From cooking to clean up, the restaurant style sides and convenient grease drain make this griddle simple and easy to use. Heat diffuser plates have been added to evenly distribute heat and reduce hot spots on the griddle. The griddle comes pre-seasoned with Camp Chef's True Seasoned Finish making a natural cooking surface that is ready to use out of the box. 16 inch x 38 inch Professional Flat Top Griddle Whether you're at the family reunion or tailgate party, sometimes you just have to cook a lot of food for a lot of people. No matter the size of the crowd, the Professional Flat Top Griddle is big enough to get the job done. From cooking to clean up, the restaurant style sides and convenient grease drain make this griddle simple and easy to use. Heat diffuser plates have been added to evenly distribute heat and reduce hot spots on the griddle. The griddle comes pre-seasoned with Camp Chef's True Seasoned Finish making a natural cooking surface that is ready to use out of the box. 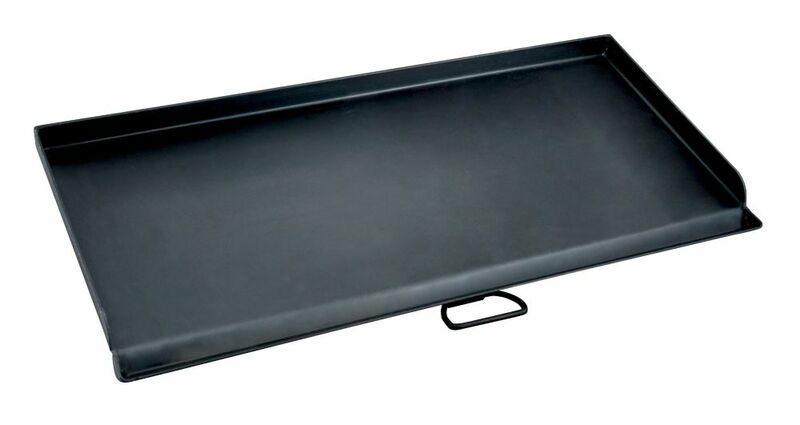 16 inch x 38 inch Professional Flat Top Griddle is rated 4.8 out of 5 by 11. Rated 4 out of 5 by TROY BOY from Even heat I bought this griddle to upgrade from my single burner griddle. Used it on one camping trip so far and was able to cook for 6 people easily. Fit 5lbs of potatoes 10 pieces of bacon and 6 smaller ham steaks all at once. Really even heat except very outside edges, but I used that to my advantage to put the bacon when it was done while waiting for potatoes to be finished. My only complaint is the black coating wears of pretty fast with metal spatula. Cast iron conditioner is a must to keep your griddle looking good. Small price to pay after investing in a awesome griddle. I own several Camp Chef products and have no serious complaints about any of them. Whenever anything has ever been faulty there customer service is awesome about making things right. Rated 5 out of 5 by Granola from Perfect heat distribution. Love It ! Immediately upon receiving this griddle , I put it to the test on a 1 week camping trip. On this trip I was cooking breakfast , lunch and dinner for everyone. Now it was not intended to be that way but after the first couple of meals, I along with my Camp Chef griddle were nominated as the camp kitchen. Burgers, Steaks ,Fries, Eggs, Pancakes, Brauts even Salmon ! All was perfectly cooked and had the added benefit of an easy clean up! Heat is evenly dispersed along the entire griddle just manage the temp for what your cooking and sit back and enjoy. Even the cooking part is fun! The food is fantastic. Camping, Hunting, Fishing, Family outings, Entertaining at home... I will use it every time ! The "test" ??? Yes you guessed it... The Griddle passed with flying colors! Rated 5 out of 5 by kapton from quality as expected This griddle top is a excellent addition to my outdoor cooking arsenal.